DC office Tinsukia & Sub Divisional Officer Sadiya Recruitment 2018 September :- In pursuance of sanction accorded by Govt. of Assam vide letter no. GAG(B)71/2014/131 dated 05.09.2018, applications are invited from the intending candidates in the standard form of application published in the Part-IX of the Assam Gazette for filling up two nos. post of Head Asstt. in the office of the Deputy Commissioner, Tinsukia and Sub Divisional Officer (Civil) Sadiya, in the District of Tinsukia. 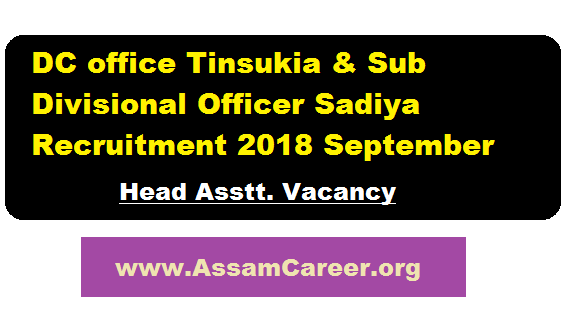 In this section, we will discuss in details about the recruitment of Head Assistant Posts under DC office Tinsukia & Sub Divisional Officer Sadiya Recruitment 2018 September with vacancy details, eligibility criteria, salary with other details and requirement. Scale of Pay : Rs. 22,000/- to Rs. 87,000/- P.M. Grade Pay Rs. 10,300/- (PB-3) per month plus other allowances as admissible under the rules from time to time. Applications stating age, education qualification, home district and experience of working the branches with period of incumbency in each branch supported by attested copies of certificate/orders etc. and a copy of recent passport size photograph along with the application form should reach the undersigned on or before 12.10.2018. Application should be submitted through proper channel and the candidates may have to appeal for an interview board at their own cost if and when called for.